Acharya Shri Bharimalji, the second Acharya of terapanth was born in vikram samvat 1803 in Muham village of mewada. He belonged to a lodha family of Oswals. His father and mother were known by Kishnoji and Dharini. He was consecrated in sthanakwasi. But at the age of ten by swamiji. He was a simple and straight forward of humble disportion, he always upheld the truth. 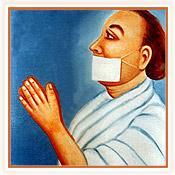 He also parted his ways from sthanakwasi alongwith Acharya Bhikanji in view of their holding different opinions. Muni Bharimalji was a hard stead fast working intellectual ascetic of very high order. He received his education and was consecrated by Swamiji. He showed his unique potentiality by committing to memory thousand of verses. He had deep interest in the study of scriptures. Often he used to reckon two thousand verses of Uttardhyana sutra in standing posture in one prahara during night hours completing the evening ‘Pratikramana'. He was extremely admit in scriptural art. This littering work was beautiful almost all the scriptures written by swamiji were rewritten by him. These copies of his work are still considered as authentic work of swamiji. He used to consolidate whatever swamiji used to admonish either through his teaching which could be of in any form as essays, writeup or new guidelines. He wrote around five lakhs poems in his life time. Perhaps no one has hither to attempt so much of write up in Terapanth Sect. Swamiji used to first apply all the new codes of conduct on Acharya Shri Bharimal with the result that all the other monks in the order used to take cue from him easily. Once, while applying an acid on Bharimalji Swamiji said “ If someone finds a fault you will have to undertake three days of continuous fasting”. In reply Bharimalji replied “ I have to undergo this penance on the veracity of mistake or also if someone makes the false allegations against me”. In reply Swamiji said “ You shall have to undergo the penance on any count. May it be a repentance of the mistake made or it may be taken on emergence of Karmas”. Bharimalji gracefully accepted the solemn words of swamiji. He was contentious towards each and every code of conduct. Infact he never gave any chance to any one to pinpoint any fault in his entire life. Muni Bharimalji was installed as Yuvacharya on the seventh day of Krishnapaksh 1832 Vikram Samvat and he became Acharya on the 13 th day of the bright fortnight of Bhadrava vikram samvat 1860, he was extremely courageous and maintained poise at all times. Once some of the opponents said to the then ruler of Udaipur that revered Bharimalji is against chanting and companion. He should not be allowed to live here for chaturmas otherwise the misery may befall on people. The ruler of Udaipur believed and ordered swamiji to leave the place, following the code of asceticism he left Udaipur and came to Rajanagara Shri Kesaraji Bhandari the then resident of that place on a opportunate time said to the ruler in confidence that ‘My Lord you have turned a saint out of our city who does not even entertain to kill an ant is being driven out of Mevada. Not withstanding, you should bear in mind that nature would never pardon a person who troubles saints. Many unaccepted events have taken place in this region and then indication of nature's wrath after saints have been driven out. The ruler took note of whatever was informed to him by Shri Kesharaji. Thereupon he repented on mistakes, he immediately wrote a letter to Bharimalji wherein he has repented for his folly. The ruler has at once decided to hand over a letter to Bharimalji wherein he has stated as “ Please have your mercy upon me & my public he prayed Bharimalji to return at once. In view of his old age Muni Bharimalji did not came back to Udaipur . The ruler thereupon sent a second messenger and prayed him to visit Udaipur . This time Bharimalji has sent his thirteen saints along with Muni Hemrajji, Raichandji, Muni Jeetmalji to Udaipur along with other saints. There are numerous incidents in the life of Acharya Shri Bharimalji which reflect his grace. Thirty eight male and fortyfour female ascetics were consecrated into asceticism during his Acharyaship. He expired on the eight day of dark fortnight of Magha Vikram samvat 1878 after observing sagari fast of six prahars and chaovihara of three praharas.